UPDATED: The new maps have finally been released and will be effective August 28, 2018. There will be a required Public Hearing prior to the June 19, 2018 BOC meeting to take comments on the maps. The Town sent letters to all property owners to notify them of the public hearing. To date, the maps have been delayed and there has been no clear expectation of when they will be effective. At the February 2017 Commissioners’ Meeting, HBPOA Board Member Mike Sullivan spoke about the importance of getting the maps in place and urged the Commissioners to act. The Commissioners passed Resolution 17-01. The Resolution has been distributed to all of our representatives. In addition, several HBPOA Board Members attended Representative Rouzers’ Town Hall meeting at BCCC to communicate the importance and urgency of the issue. 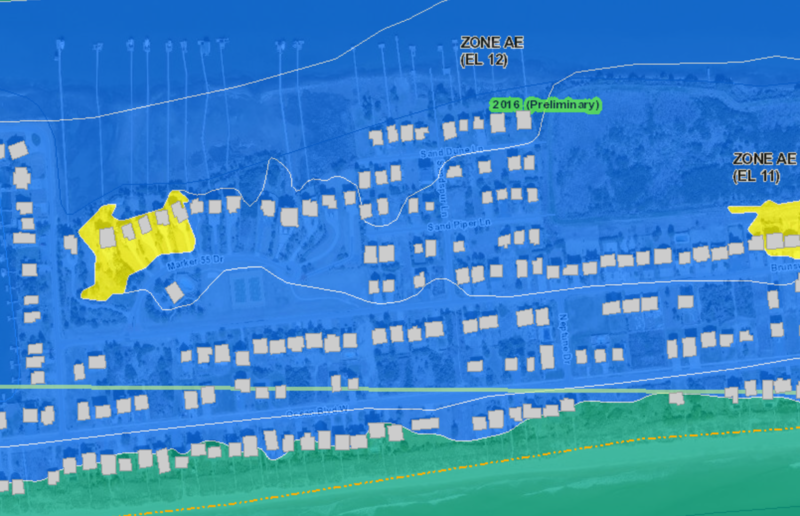 At long last, I have some information for you about the flood maps for Holden Beach. It looks like they pushed the date back by one year due to ongoing appeals to the proposed maps. I’m sorry I don’t have better news, but the complicated nature of the flood map drafting and implementation process leaves lots of opportunity for delays. You can find the email I received from our contact at FEMA about it below. The good news is, just yesterday Congressman Rouzer signed on as a cosponsor for a bill that would require the Government Accountability Office to review flood insurance rates and flood insurance rate maps under the national flood insurance program within the year of the bill’s enactment and every subsequent four years thereafter. This would help ensure maps stay up to date and prevent people from paying more than necessary for their insurance premiums. The bill is HR 879, the Flood Insurance Integrity Act. FEMA’s Region 4 staff have provided the following information. They are the subject matter experts on specific maps. Brunswick County is part of the Lumber Basin, and it has a projected Letter of Final Determination Date of 7/19/17, which makes the Effective Date: 1/19/18. It is also part of REG-NC Cape Fear (C) & Lumber (W) Basins Missing Panels: PMR8 which dealt with missing panels from Brunswick and a few other counties. The Village of Bald Head was left off the original Flood Hazard Determination Notice (FHD) Notice, so it ran through an Appeal Period by itself. NC’s Floodplain Management Program was waiting for the missing panels to go through the Appeal Period and then have them go Effective with the Brunswick county panels in the Lumber basin. Supply, NC is an unincorporated community in Brunswick County. HBPOA encourages everyone to contact their Federal, State and County elected officials. We have drafted sample letters which you can use, but individual calls and letters are sometimes more effective than form letters. The letters are for the Congressmen representing Holden Beach. If you are not a full-time resident you can find your elected representatives here. Note: These draft letters were updated April 15, 2017 to reflect the new information from Congressman Rouzer’s staff. 4-3-17 NC Emergency Management Update on Flood Maps Click here. Sea-level rise and its future risks must be factored into any reauthorization of the National Flood Insurance Program, warn the actuaries who assess risk for insurers. A public policy report released yesterday by the American Academy of Actuaries calls on Congress to consider sea-level rise — among many other factors — as part of the reauthorization of the federally backed flood insurance program. The prospect of rising seas is the change to global climate that’s “the hardest to overlook,” the report says. The U.S. is especially vulnerable to large property losses because of the amount of valuable property in at-risk coastal areas. The Academy of Actuaries also suggests that better mapping and data might help people with homes at risk of flooding by opening up the market to greater participation by private insurers and reinsurers. The program remains $24 billion in debt, in part because of large losses after Superstorm Sandy and Hurricane Katrina, as well as losses last year after flooding in Louisiana and after Hurricane Matthew in the Carolinas. The report found it would be impossible to maintain current premiums coverage and eligibility in the face of sea-level rise, without severe limits on construction or massive investments in infrastructure. Otherwise, the U.S. faces exposure to “enormous program losses” and additional debt. However, improvements in how flood risks are assessed and modeled already are reducing the uncertainties surrounding flood risk, the report notes. “Better data and more advanced models are giving us a clearer view of flood risk, which opens up additional opportunities for private insurers and reinsurers to underwrite flood risk,” Rade Musulin, the academy’s vice president for casualty, said in a statement. Most Americans support updates to how flood insurance is managed, according to the findings of a national survey released yesterday by the Pew Charitable Trusts’ Flood-Prepared Communities project (Climatewire, April 6). Most Americans surveyed said they think that when a house is sold, the sellers should have to disclose whether it has ever been flooded. They also think that construction in flood-prone areas should be required to better withstand the impacts of flooding. The poll’s finding had broad bipartisan support, a key factor as Congress reauthorizes the program this year. The American Academy of Actuaries and several partners last year released the Actuaries Climate Index, a way of tracking the frequency of extreme climate events. It’s also designed to help actuaries, policymakers and the general public understand climate trends and their potential impact. The Actuaries Climate Index is a way of tracking the frequency of extreme climate events. The first index showed that the frequency of heat waves and extreme rain events is on the rise, along with sea levels (Climatewire, Dec. 1, 2016). The index provides a quarterly measure of changes in extreme weather events and sea levels. Risks measured in the index, which spans from 1960 to 2016, are compared against the average frequency of the same events during the reference period. The index looks at the frequency of temperatures above the 90th percentile, the frequency of temperatures below the 10th percentile, the maximum five-day rainfall in a month, consecutive dry days, winds above the 90th percentile and sea-level rise. Eventually, insurance companies could use the information in their models to look at what leads to insurance claims and better understand how climate is affecting their claim costs.